You’ll find more than an abundance of questionable, murky water in the LA River this summer: Artists Peggy Weil and Refik Anadol have joined forces to project a series of videos and animations along the 48-mile river until August 14th. 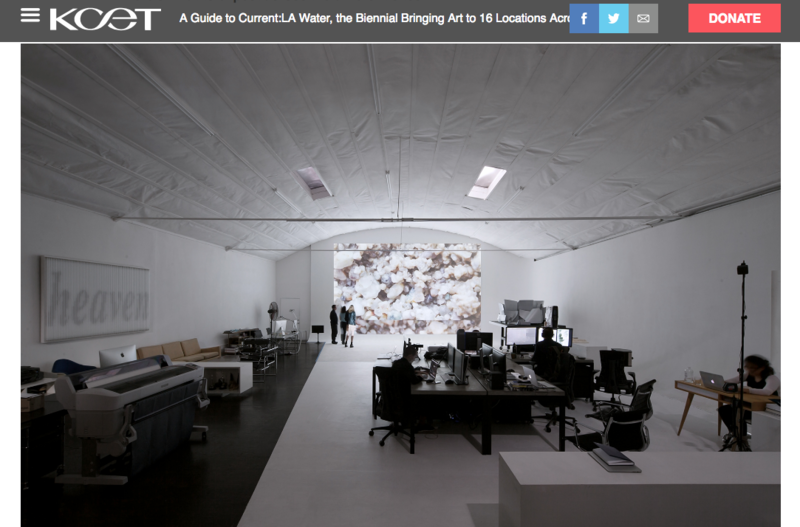 Titled UnderLA, the video installation is a commission for CURRENT: LA Water, a public art biennial currently celebrating its inaugural year. With the whole city as a potential exhibition space, the project ended up in two specific locations: the First Street Bridge and at the origin of the LA River in Canoga Park. 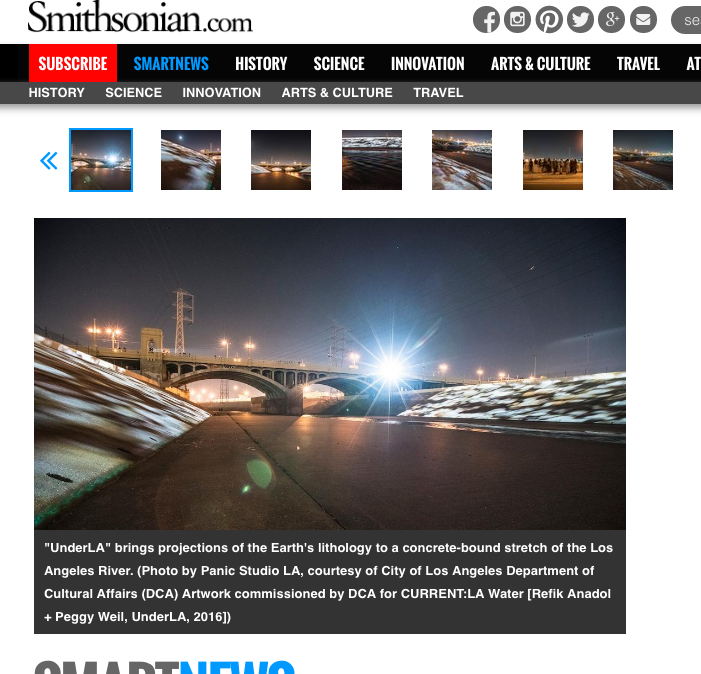 The five video sequences projected onto the river depict the inner geological workings of Los Angeles, showing the lithological soil and sediment that lie beneath the metropolis. The videos show a wide range of earthly depth, starting at 10 feet and reaching as far down as 1,400 feet beneath the soil, highlighting over 2 million years of geological development. The work is a meta-unraveling of what makes up Los Angeles; uncovering that which is underneath the city but rarely seen or discussed, displayed on the familiar surface its citizens interact with everyday. Both of the artists came to the project from distinct backgrounds. Weil had previously worked on a project that visualized the data of global groundwater on signboards in Times Square while Anadol has worked with public architectural installations for the past 7 years, and created an incredible projection mapping show inside the Walt Disney Concert Hall. As two LA residents working in large-scale installations, the LA Public Art Biennial revealed itself as an incredible opportunity to join their two crafts and create a meaningful artistic exploration into the science of their own city. “We inhabit such a small slice of space on land, and yet our lives and society are profoundly affected by our geology,” Weil tells The Creators Project. If you’ve noticed something beautiful while driving through Los Angeles lately, you’re onto something artsy. 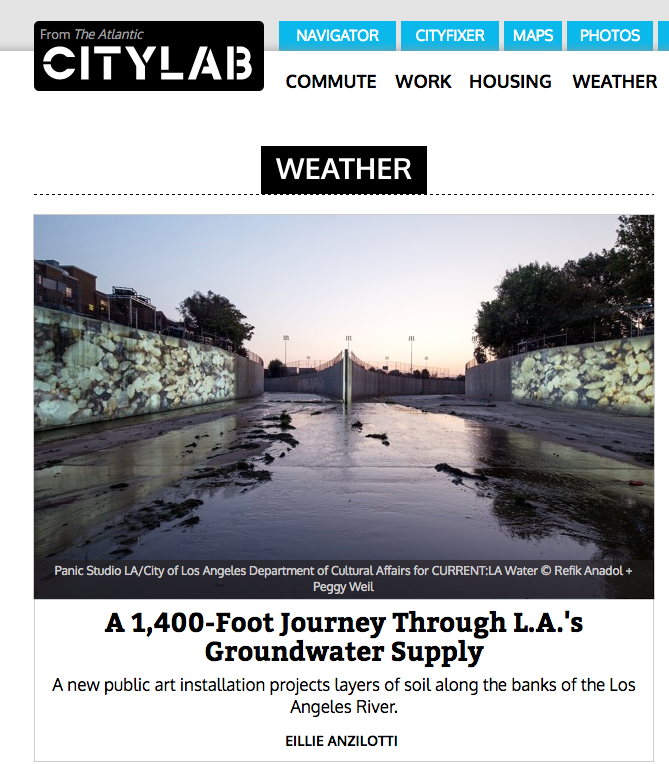 The city is currently in the midst of Current:LA Water, a public art biennial with the goal of bringing the city’s most critical issues into a conversation using the power of contemporary art. 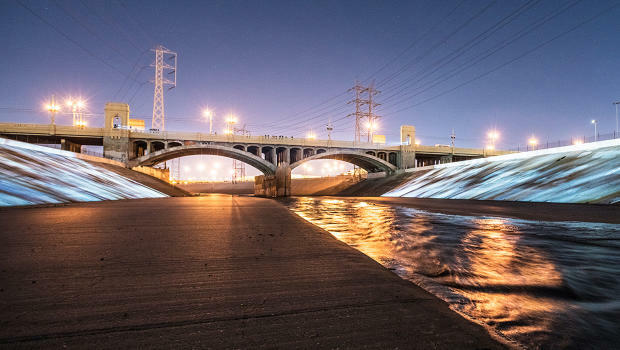 And one of the project’s most ambitious works of art is one that draws on one of the city’s most fraught symbols, reports FastCoExist’s Adele Peters: The snaking, nearly dead Los Angeles River. Ask someone in Los Angeles where the city’s water comes from, and they might mention the Colorado River or the massive aqueduct that brings water hundreds of miles from the north. But some of the city’s water is also local. A new work of art called UnderLA, projected on the concrete sides of the L.A. River, shows the water hidden underground. 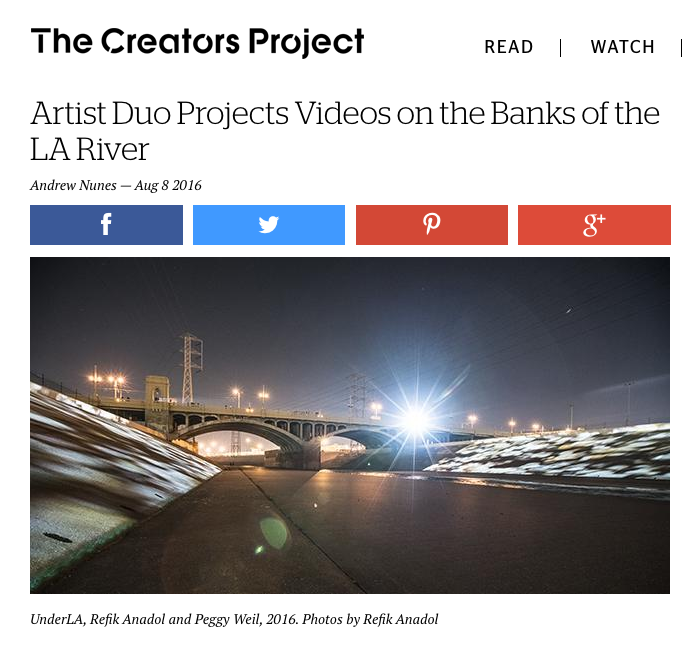 “We used the L.A. River as a canvas, and light as a material, and we project several visual stories,” says artist Refik Anadol, who collaborated with Peggy Weil on the project. It’s 1 of 16 installations up now around the city—on and around the river—as part of Current:LA Water, a new public art biennial. Some of the projections in UnderLA show layers of sediment in local wells. “As you go down in depth, you’re also going back in time,” says Weil. “I think by 1,000 feet you’ve gone back a million years. There’s an emotional component to this, because it’s our history, and it’s also our future.” Another part of the visualization shows how water levels have risen and fallen with drought and overuse. Over the next few decades, the city plans to dramatically increase the amount of local water it uses—partly by redesigning infrastructure so the little rainfall L.A. gets goes back into the ground, instead of draining down streets to the ocean. The artists wanted to make data about that groundwater accessible and interesting. “We tried to visualize this data by poetic connection,” says Anadol. “UnderLA” by Refik Anadol and Peggy Weil at 1st Street Bridge, between Santa Fe Avenue and Mission Road, downtown Los Angeles, and at the mouth of the L.A. River, 6883 Owensmouth Avenue, Canoga Park. Though it doesn’t flow, groundwater is very much a part of the city’s water system. Artist Peggy Weil and Refik Anadol finally let Angelenos see deep into the earth by projecting arresting images of porous rock capable of holding and transmitting water — L.A.’s aquifers — onto the concrete banks of the Los Angeles River. The artist team worked with USGS geologists to obtain data and images of ground slices below an Angeleno’s feet up to 1,400 feet below the ground. The projection is a visual walk through time, says Weil. At 1,400 feet, the ground holds marks of events that can be traces as far back as 2.5 million years ago. The images are interspersed with data visualization that shows the rise and fall of water levels at different points in time. Its apices and nadirs are a reminder of Los Angeles’ continual struggle for hydration. The City of Los Angeles will commission up to 15 multidisciplinary artworks and public programs that focus on the city’s environmental concerns and engage residents for its inaugural Public Art Biennial. Current:LA, a new public art biennial, signals a sea change in the way culture is created, disseminated, and experienced in Los Angeles.